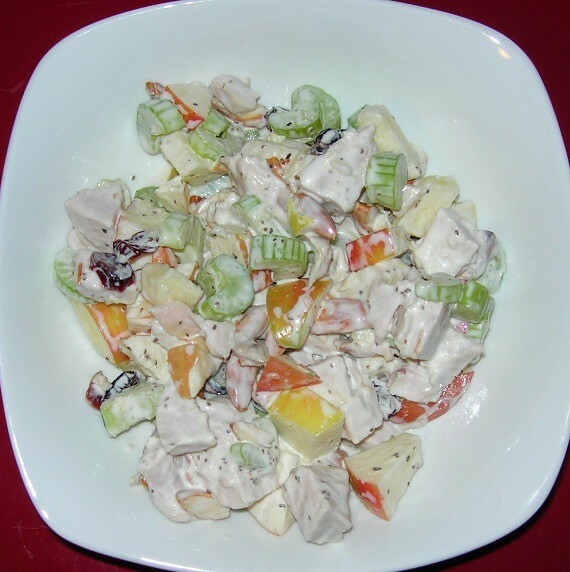 This is not a traditional Waldorf salad, but using it as my inspiration, I made a delightful post-Thanksgiving turkey salad. Chop up 1 apple (Gala) and 1 celery stalk. Chop 4 oz of turkey white meat. Add an ounce or so of dried cranberries and about 6 almonds, sliced in half and toasted. Mix together and dress with 1 TBSP of mayonnaise and the juice from half a fresh lemon. Add salt and pepper to taste. 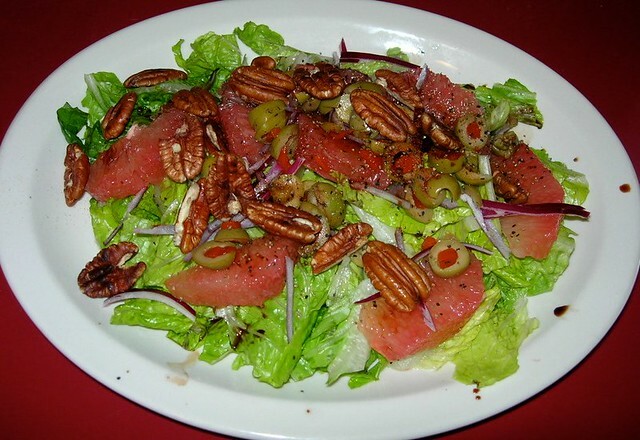 I think walnuts or pecans would have been meatier and better in the salad than the almonds, but it was still delicious. The dried cranberries add a tart sweetness that is even tastier than grapes. 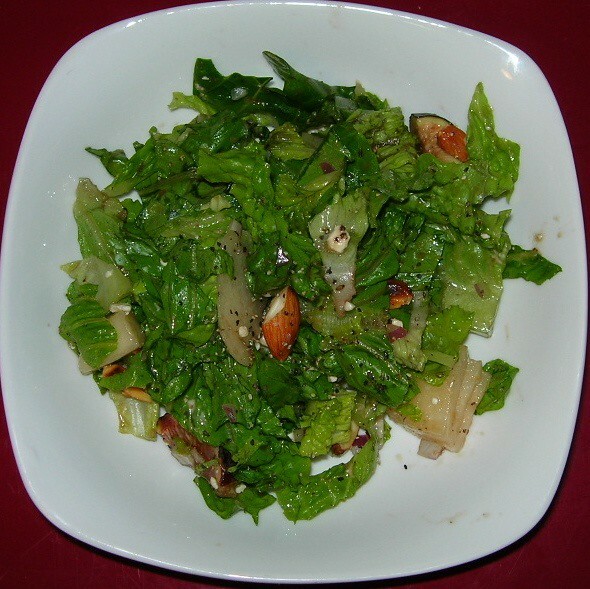 Rinse and chop 2-3 leaves of romaine lettuce and toss in a bowl with 2 chopped figs, 1/2 sliced pear and 2 oz of feta. Add about 8 almonds lightly toasted and chopped. Add some salt, pepper and a bit of walnut oil and balsamic vinegar to your taste. Rinse and chop up 4 leaves of romaine lettuce. 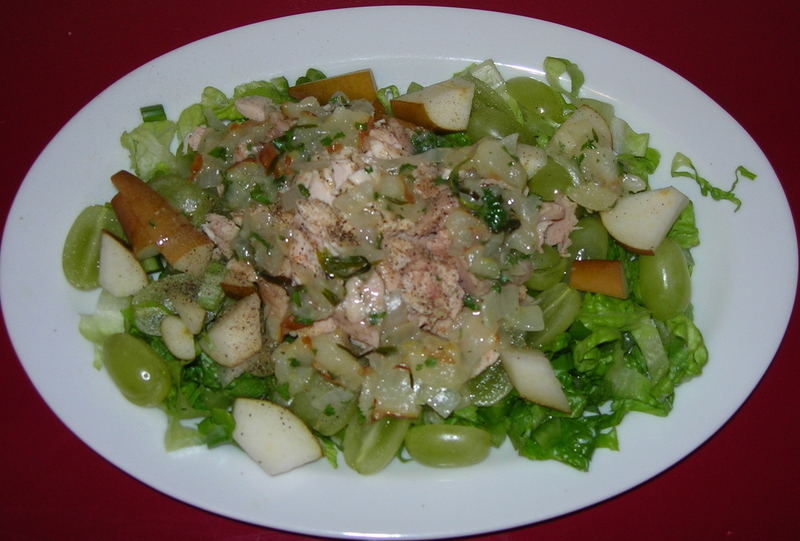 Slice two thin slices from a Spanish onion and break into fine circles and scatter over the lettuce. Slice 3 oz of ham and spread on top of the onions. Drizzle very lightly with olive oil and splash a bit of balsamic over everything. Meanwhile, poach an egg and place it on top. Add some salt and pepper and serve. 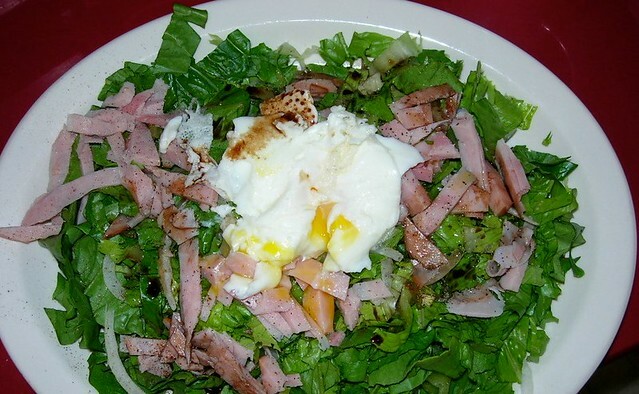 When eating, break the yolk and mix it well with the oil and vinegar. Yummy! This is great comfort food and irresistibly delicious. Put an inch of water in a small skillet and bring to a near boil. Add a dash of vinegar. Crack an egg into a small bowl and transfer the egg to the simmering water. Use a slotted spoon to push the white together and put a lid on it and remove from the heat. Check it in 4 minutes to see if it’s done. It should be, but if you like it a little more done, just keep the lid on a bit longer. Use the slotted spoon to transfer the egg from the skillet. I chopped up two slices of bacon and put them on medium heat to fry. I sliced 1/2 of a medium yellow onion and added to the bacon. I then added 2 minced garlic cloves and continued cooking until the onions were transparent. 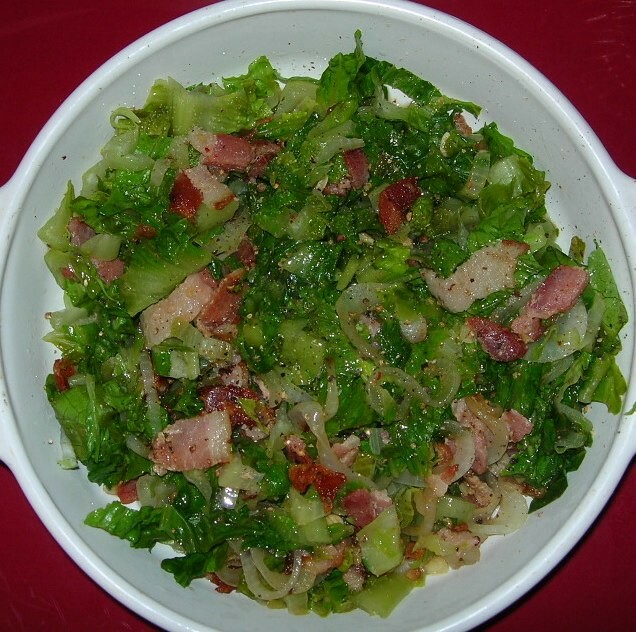 Meanwhile I chopped up 2 cups of romaine lettuce and tossed them into the pan and stirred. I let cook just until slightly wilted, but not limp – about a minute. I squeezed the juice of one lemon on top added salt and fresh ground pepper and served. In preparation, I sliced a red onion on the mandoline at the thinnest possible setting and put them in a container to use in multiple dishes. 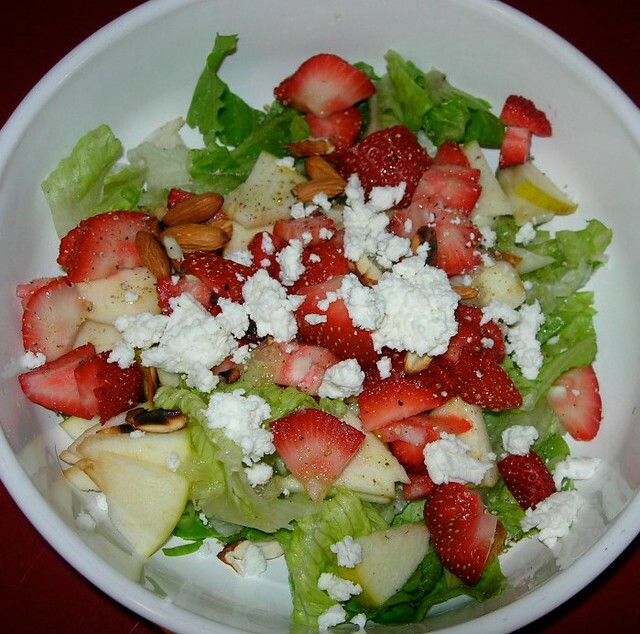 I took a small handful to use in this salad – perhaps 2 TBSP total. I also sliced a pear at the medium setting, saving about 2/3rds for later and using 1/3rd in the salad. I grabbed a small handful of almonds, cut them in half lengthwise and toasted them on medium-high heat. I cleaned three stems of mint, stripping off the leaves and chopping them finely. I cleaned and chopped 4 leaves of romaine lettuce and layered it on a platter. I then layered the red onion and the pears. 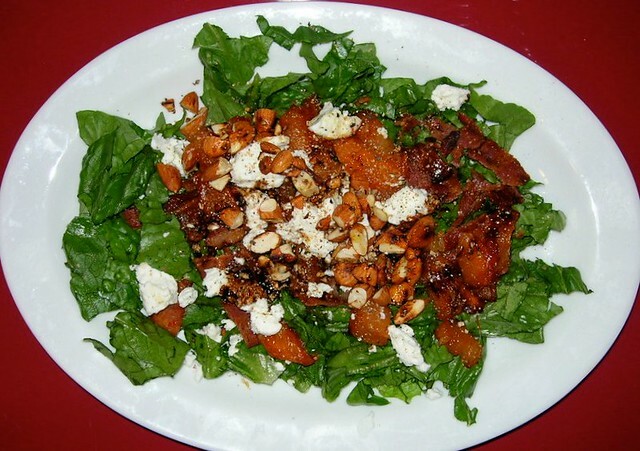 I sprinkled the mint leaves and the toasted almonds on top. I drizzled about 1 TBSP of olive oil and about 2 tsp of balsamic vinegar on top. Some fresh ground pepper and salt and it was done. 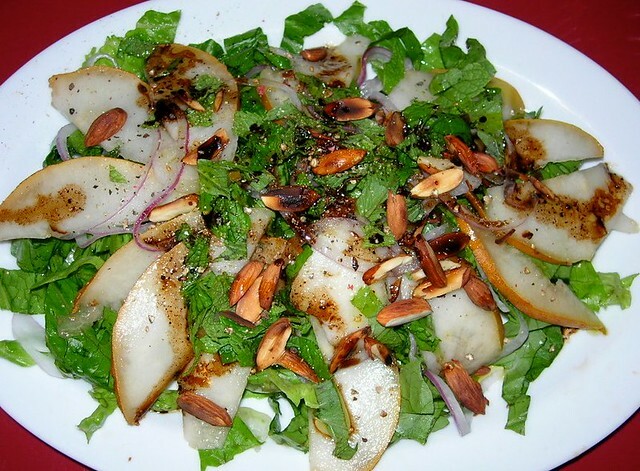 The onion was important to balance the sweetness of the pear and the almonds gave it some necessary heartiness. I had originally planned to include chevre but the pear was so very ripe and sweet that I decided against it. It’s a new variety of pear for me called Taylors Gold and it is deliciously sweet and an idea fresh eating pear or for sauces and jams, but perhaps a bit tender for salads. 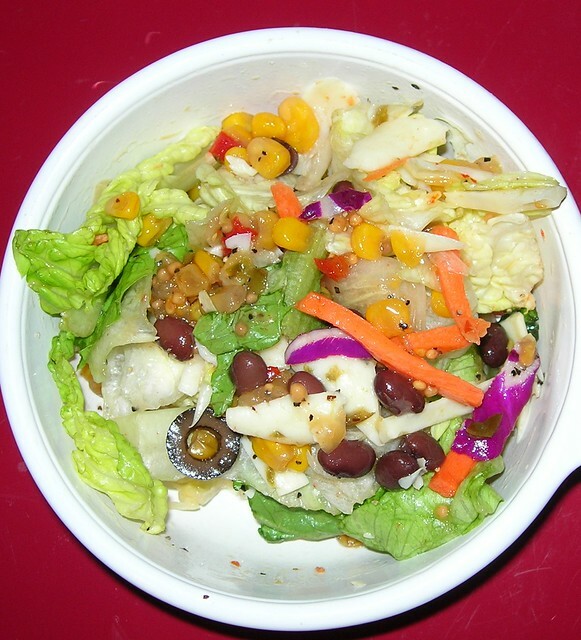 Nonetheless, it didn’t break apart in the salad or turn to mush. As for flavor, it could not possibly be tastier.